The DESIREE decision support environment is maturing day by day! The interface is shaped up for user validation, whereas the functionalities and the different modules are gradually integrated. The team has just prepared a new demo video (v.2, January 2018). Take your sneak preview today! 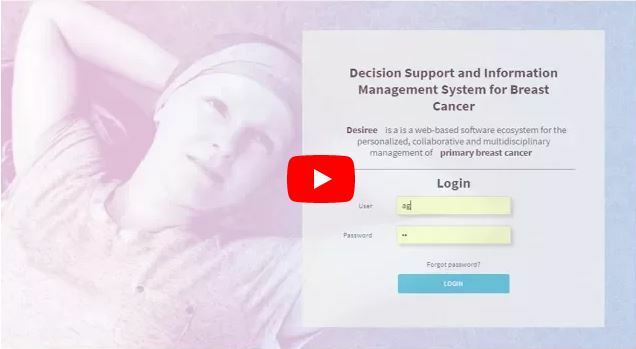 DESIREE will help BC clinicians in their decision making process, with technology that includes advanced clinical decision support systems (based on formalized clinical guidelines, knowledge discovery, and case based reasoning), image-based breast and tumour characterization tools and predictive modeling for 3D breast reconstruction. You are receiving this newsletter because you have subscribed through http://desiree-project.eu/ or a DESIREE partner. Should you wish to stop receiving this email newsletter, please click the Unsubscribe link below.